Harrington Investments uses a top-down, bottom-up fundamental approach to portfolio management. Our top-down approach looks at emerging trends in the world, such as the growth of clean tech, peak oil, and population demographics, to identify sectors of the economy that we believe will prosper in the coming years. Our bottom-up approach looks at the financial health of companies in these sectors to try and identify the leaders in the emerging trends of tomorrow. We maintain a proprietary SRI securities list consisting of domestic large cap and mid-cap stocks, and foreign ADRs which pass our environment, social, and governance screens. Only securities on this list are used in client portfolios. 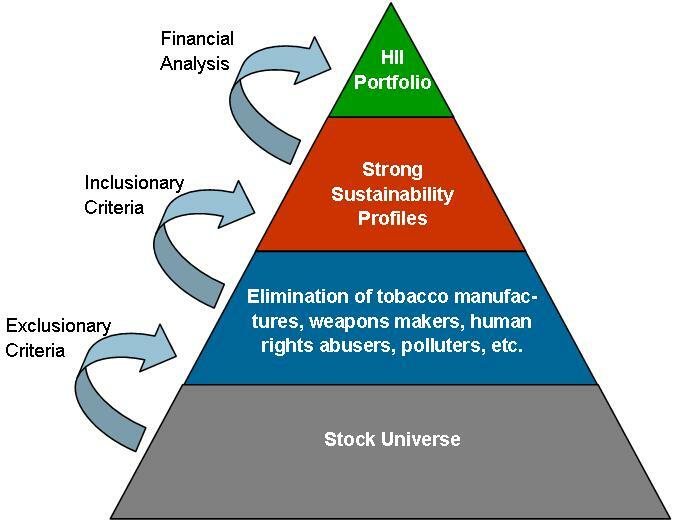 Our investment committee uses the following three step analytical approach to add new stocks to our proprietary list.